Today more than ever people appreciate a break from the digital noise and seek information offline. That’s why marketing is trending back to direct mail pieces, brochures, and postcards that you can touch and feel. Handwritten thank-you notes and elegant invitations make a lasting impression over emails and evites. Corporations are going outside the box with their marketing messages and tangible tactics – even cleverly designed shirts for an event can get your team noticed! Customers still like to have printed instructions and helpful guides, even though they can go searching online for a digital version. Printed pieces last longer, too – concert tickets are often keepsakes and store coupons in your wallet serve as a visual reminder. 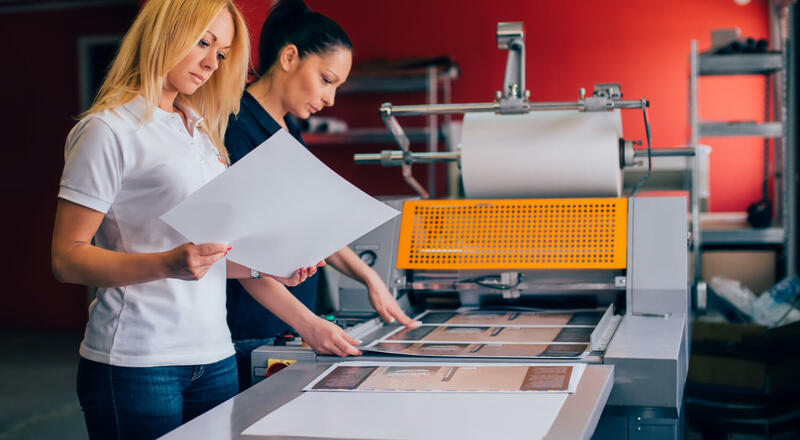 Our one-stop marketing and printing services are as diverse and creative as your marketing plan: Get ready to stand out and get noticed! Print is a foundational part of marketing strategy and business growth, and J-C Press is here to assist you with all your printing needs from clever die-cut marketing pieces, variable data envelope printing, and unique book binding to printed tradeshow banners, creative flyers, and affordable pens for advertising your business. Request a sample kit to see the wide variety of materials we have in stock and how they can be used on your next project.